So often when there’s a story about two young women, one of them is relegated to being only the best friend. 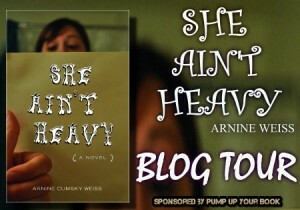 What I found refreshing about Arnine Weiss’s She Ain’t Heavy is that even though the novel is primarily Teddy’s story, even when she isn’t the character in favor, so to speak, she is never the sidekick, and neither is Rachel. That said, the part of me that was raised to be strong, independent, and self-sufficient was frustrated by a lot of this story, largely because it reminded me that I’ve been supremely lucky. I’ve never been unemployed (except by choice), never struggled to find a place to live, always had really solid relationships with my parents and friends, and when I read about people who do have problems finding work, or a home, or friends, instead of sympathizing, or empathizing, my middle-class privilege rears it’s ugly head. But that’s beside the point. Arnine Weiss has drawn many wonderful characters in She Ain’t Heavy, and I enjoyed ‘meeting’ all of them. I love that each character speaks with her (or his) own voice, and that all the dialogue sounds natural. And, personal frustration aside, I did appreciate that nothing came easily for Teddy. 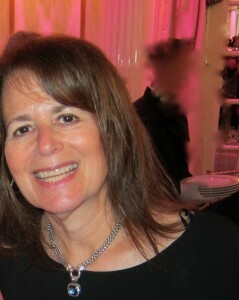 She worked for every life change, and earned every good thing that happened to her. 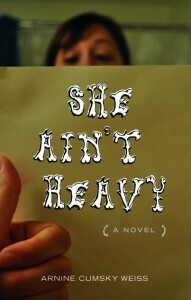 She Ain’t Heavy is contemporary women’s fiction of the best kind: it makes you think, and it makes you look at your own life, and compare it to the characters in the book, but it’s also just a really good read. Goes well with macaroni and cheese (with pepper from a Santa boot shaker) and diet Coke.